Russian Android Shop - Wow! 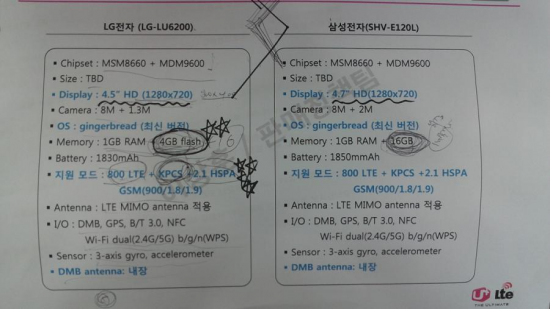 The Samsung SHV-E120L was first seen a little while ago on NenaMark Benchmark and we assumed it could be using a 1.5 GHz processor, 1280×720 resolution, and android 2.3.5. Now we have more information and looks like this phone is directly aimed at taking down the LG U+. If you look at this picture the LG U+ is on the left. and the Samsung SHV-E120L is on the right. Differences? Besides the Samsung SHV-E120L having a better front facing camera, bigger screen and a bigger battery they’re practically the same phone. Both these phones seem to be amazing and it will come down to if you like LG or Samsung more and if 4.7 inches is too big for you? Stay tuned for more information.